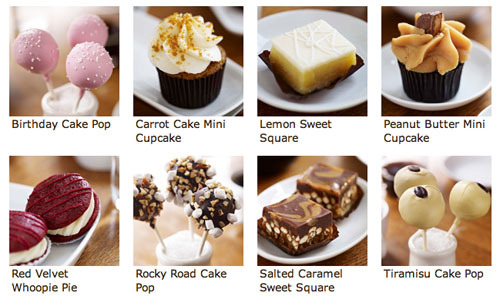 Starbucks now has petite desserts. Is Starbucks following my blog? Yes, I am a fan of all mini food. But look at these mini treats... I have mentioned most of these in just the past few weeks. Cake pops?! Salted Caramels?! Whoopie pies and mini cupcakes go way back! I arrived around 2:40 and only some cake pops were left - the Birthday version was as yummy as it was cute! What will I try tomorrow? Hmm ... Sweet dreams everyone! I happened to drive through this afternoon, and I was offered a little cake pop with my coffee. How sweet, in all senses! I've been to my S-bucks two days in a row and they don't have them! Do you have to be there in the afternoon? We were there this evening and they still had a few left. I had the salted caramel square yesterday- it was AMAZING! I swear you have a stalker in an apron who faintly smells of coffee. BTW, the tiramisu cake pops are to die. I missed it by 2 hours that day. darn!